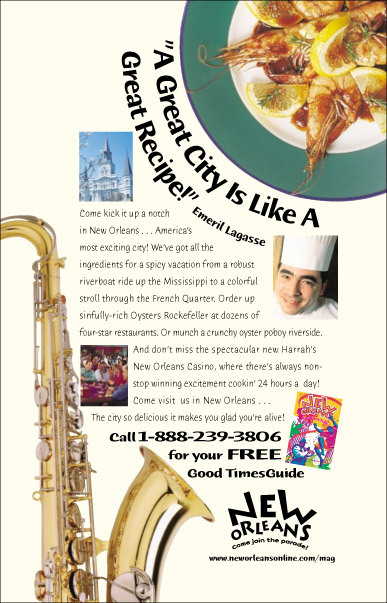 From 1987 through 2001, MSP guided the marketing for tourism for the city of New Orleans. Using revolutionary a approach to marketing with emphasis on direct response, we increased the number of inquiries by 500% while the budget remained the same during the final five years of our client/agency partnership. Hotel occupancy rose more than 30 percentage points and the average daily room rate increased each year. We utilized direct response techniques to monitor the campaign and modify our message daily, if necessary. We tracked responses and were able to deliver detailed reports. As a result, our cost per response was consistently less than half that of the State of Louisiana during the same five year period. 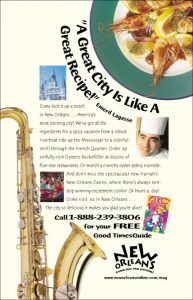 Other cities and even Disney have imitated our techniques. Over the final three years we were able to generate $4.5 million of cooperative advertising programs. An international hospitality and tourism research group, Longwoods International, designated our campaign as the most efficient and effective leisure tourism in the United States.